Reform Judaism refers to the spectrum of beliefs, practices, and institutions associated with Reform Judaism in North America and in the United Kingdom. It is characterized by a liberal attitude toward the Jewish law and rejects virtually all aspects of the ceremonial and dietary laws as non-binding. The term also may refer to the Israeli Progressive Movement, the worldwide Progressive movement, and the Reform movement in Judaism generally. The Reform movement began in Germany in the nineteenth century and soon spread to other European nations, nearly simultaneously springing up in North America. While the movement was united in seeking to update and liberalize the Jewish tradition, divisions soon emerged over whether specific Jewish laws should remain binding unless there was reason to reject them, or whether all but the Jewish moral law should be abandoned as obsolete. In North America, this led to a split between the denominations known today as Conservative Judaism and Reform Judaism. Reform Judaism today is the largest U.S. Jewish denomination. It does not require circumcision, ordains women, allows rabbis to perform interfaith marriages (although many do not do so), and emphasizes the role of individual conscience in determining which Jewish traditions should be observed. It formally rejects the concept of a literal Messiah, preferring to speak instead of a Messianic age to come, but allows prayers for the Messiah's coming. Originally rejecting Zionism as incompatible with its principles, since the Holocaust Reform Judaism has officially supported the State of Israel. Philanthropist Israel Jacobson was an early Reform-minded Jew. Abraham Geiger sought to de-nationalize the concept of Jewish identity. In response to the Enlightenment and Jewish Emancipation, reform-minded thinkers within German Jewry—such as Israel Jacobson, Abraham Geiger, Samuel Holdheim, and Leopold Zunz—sought to integrate Jewish life with German culture and reconcile Jewish belief and practice with the modern age. Holdheim (1806-1860) typified the classical approach of Reform Judaism toward halakha, holding that modern Judaism should be based solely upon monotheism and morality. At first the reformers worked only within existing congregations, but this attitude shifted after the German state allowed the Jewish community to separate its organizational structures. The new Hamburg Temple, founded in 1818, became a major center of liturgical reform, with an entirely modified service, an organ, a choir, and a new and much abridged prayer-book. During the 1840s and 1850s, separate reformed congregations were set up in two major centers of the German Jewish community, Frankfort and Berlin. Reform efforts were also evident in Denmark and Austria. Around the same time, the Reform movement in North America started to emerge, but with none of the governmental opposition and regulation facing its European counterparts. In 1825, lay members of Beth Elohim in Charleston, South Carolina, founded the Reformed Society of Israelites as a distinct group seeking mild reforms. German born David Einhorn would become a leading figure in American Reform Judaism after immigrating to the U.S. in 1855. In Hungary, Talmudic scholar Aaron Chorin (1766-1844) took a radically progressive view toward the halakha. His system liberalized the kashrut (kosher) requirements, condemned kabbalah, abolished amulets, supported the use of the organ in synagogue services, and instituted changes in the Jewish prayer practice with a view toward making the tradition less nationalistic and more modern. In Budapest, moderate reforms were undertaken in various cities and outreach efforts were made to various German rabbis, including Zacharias Frankel, widely seen as the pioneer of Conservative Judaism. The New Hamburg Temple (about 1845). Ignaz Einhorn, a Hungarian-born rabbi and no relation to David, put forward a program of reform which systematized the emerging ideas of the movement. Einhorn sought to abolish the ceremonial element of Judaism but retain its basic faith and morality. His tradition permitted mixed marriages, ended circumcision, did away with distinctive Jewish dress, shifted Shabbat worship to Sundays, and promoted the concept that a Jew was known mainly by his idea of God and the moral principles on which he acts. In Great Britain, reform efforts were sparked by efforts to change the liturgy at London's Bevis Marks Synagogue, as had been done with the Hamburg Temple in Germany. Despite some initial reforms in 1836, further alterations were rebuffed in 1839. 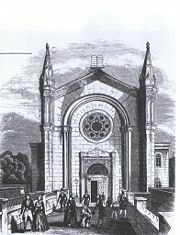 The British reformers then established an independent congregation, the West London Synagogue of British Jews, on April 15, 1840. In 1856, an act of Parliament enabled its minister to act as official registrar of marriages for British Jews. This established the full autonomy of the congregation and ensured its equality before the law with the Orthodox congregations. Isaac Mayer Wise, founder of Hebrew Union College in 1875, who presided at the conference which produced the Pittsburg Platform. In 1870, the German Reform movement created a rabbinical seminary and research center known as the ''Hochschule für die Wissenschaft des Judentums''. Across the Atlantic, by 1873, sufficient Reform congregations had emerged to organize as the Union of American Hebrew Congregations (UAHC). Shortly after, in 1875, the Hebrew Union College was established under the leadership of Rabbi Isaac Mayer Wise to improve the quality of Reform rabbis in the U.S.
As in Europe, there were significant disagreements among the American reformers over the role of tradition in the life of a Reformed Jew. In 1883, a famous banquet was planned to celebrate the first graduating class of rabbis from Hebrew Union College. The more radical element planned the banquet with a menu containing shrimp. Known as the "Trefa Banquet" (trefa referring to non-kosher food), this event intensified the conflict between the radical and conservative reformers. The conflict further intensified in 1885, when a fierce debate broke out between Kaufmann Kohler and Alexander Kohut over the nature of reform. In response to debate, Kohler called a conference of reform-minded rabbis in Pittsburg, Pennsylvania. Isaac Mayer Wise, the rabbinical head of Hebrew Union College, presided. The conference produced the Pittsburg Platform and led to a formal organizational split between those more and less conservative. In 1887, a separate rabbinical school, the Jewish Theological Seminary was founded, which would become the intellectual center of Conservative Judaism. In 1889, the more liberal rabbis organized under the banner of the Central Conference of American Rabbis. Around the turn of the century, the European reform movement gained new steam organizationally. In Germany, rabbis and followers organized under the banner of Liberal Judaism. Meanwhile, inspired largely by Claude Montefiore, Lily Montagu spearheaded reform efforts in Great Britain. Around 1902, following liturgical changes and debates, they formed the Jewish Religious Union in London. Liberal Judaism steadily gained adherents after the founding in 1911 of the Liberal Jewish synagogue, the first of more than 30 Liberal congregations in the UK. At the same time, reform-minded French Jews established the Union Liberale Israelite, which was criticized by other Jews as a revolutionary schism. In the 1920s, the Reform movement in Germany, Poland, and parts of Eastern Europe also grew, especially where the promise of Jewish assimilation into the mainstream of society was strong. This hope, of course, proved fleeting with the advent of Nazism and the rise of a new wave of antisemitism which deeply resented Jewish involvement in European culture. In 1926, representatives from the U.S. and Europe convened the first international conference for the Reform movement in Judaism and formed World Union for Progressive Judaism. With British and later American leadership, the WUPJ spread the Reform movement to many countries. Its headquarters were moved to New York in 1959, and to Jerusalem in 1973. In the United States, the Reform movement grew significantly through the Union of American Hebrew Congregations and its affiliates. In 1922, Reform Rabbi Stephen S. Wise established the Jewish Institute of Religion in New York, which merged with Hebrew Union College in 1950. 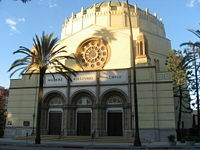 Other centers of Reform Judaism were opened in Los Angeles (1954) and Jerusalem (1963). However, by this time Conservative Judaism had emerged as the more popular of the two main trends within the movement, as large numbers of secularized Jews preferred to stay away from even the more liberal synagogues. On policy matters, the American Reform movement has had a number of official platforms. The Columbus Platform was written, in 1937, by the Reform movement's Central Conference of American Rabbis (CCAR). The CCAR rewrote its principles in 1976, with its Centenary Perspective, and revised them again in the 1999, A Statement of Principles for Reform Judaism. Along with other forms of non-orthodox Judaism—including Conservative Judaism and Reconstructionist Judaism—the U.S. Reform, UK Reform, and Israeli Progressive Movement can all trace their intellectual roots to the Reform movement in Judaism. The U.S. Reform movement reflects the most liberal pole of this movement. The UK Reform and Progressive Israeli movements, along with the U.S. Conservative movement and Masorti Judaism, occupy the more conservative end of the non-orthodox Judaisms. After a failed attempt in the 1930s, to start an Israeli Reform movement, the World Union for Progressive Judaism created the movement, in the 1970s, which is now known as the Israeli Progressive Movement. Because the first rabbis in the 1970s were trained in the United States, the Israeli press and public often refers to the Israeli Progressive Movement as "Reform." Reform rabbi leads congregation in prayers. Reform Judaism emphasizes individual conscience and freedom under God. However, Reform Judaism has refused to compromise on one principle of Jewish tradition it considers essential: monotheism. This belief is reaffirmed even in its newest statement of principles. In recent decades, however, a minority of Reform rabbis and laity have come to affirm beliefs including pantheism and deism. The classical approach of Reform Judaism towards halakha (Jewish law), based on the views of Rabbi Samuel Holdheim and other Reformers, held that Reform Judaism should be based solely upon monotheism and morality. Almost everything connected with Jewish ritual law and custom was of the ancient past, and thus no longer appropriate for Jews to follow in the modern era. This approach was the dominant form of Reform Judaism from its creation until the 1940s. Since the 1940s, the American Reform movement has sometimes evolved toward a more traditional direction. For example, many Reform congregations have increased the amount of Hebrew used in their religious services and are incorporating aspects of Jewish laws and customs, in a selective fashion, into their lives as communities. Even those in the traditionalist wing of Reform Judaism still accept the primary principle of classical Reform, namely personal autonomy. Thus, traditional halakha has no binding authority for Reform rabbis. Despite a 1973 Central Conference of American Rabbis resolution opposing the performance of interfaith weddings by its members, the CCAR does not formally forbid its members from officiating at interreligious marriages, consistent with Reform's belief in autonomy for members and clergy. Recent surveys by the Rabbinic Center for Research and Counseling show that 40 percent of CCAR rabbis perform some form of intermarriage. This is an important consideration for many Jews, and is thought to account in part for Reform Judaism' having overtaken Conservative Judaism as the most popular Jewish denomination. Many Reform congregations strive to create a culture in which families of mixed marriages feel comfortable. However, the majority of Reform rabbis who perform intermarriages still officiate only at interfaith weddings where the non-Jewish spouse is undertaking conversion to Judaism, and where both parents agree to raise their children with a Jewish identity, as defined in the Reform tradition. Reform Judaism accepts the child of one Jewish parent (father or mother) as Jewish if the parents raise the child with a Jewish identity, a departure from the tradition view that a child's Jewishness is determined by the mother's identity only. Reform's 1983 proclamation, The Status of Children of Mixed Marriages, states that allowing patrilineal Jewish descent is based on biblical and Rabbinic Judaism, pointing out that purely matrilineal Jewish descent was only first taught during Talmudic times. The Reform movement rejects those aspects of Jewish law which restrict equal rights for women. It allows women to sit with men during Sabbath services, does not enforce the ritual purity laws affecting women, has no special dress codes for women, and ordains female rabbis. Since the concept of inclusion is vital to the Reform movement, Reform rabbis encourage participation of Gentiles in religious services and festivals, while at the same time actively encourage the conversion process. Conversion of non-Jews to Reform Judaism is more likely than in other Jewish denominations, where the practice is often even discouraged or essentially non-existent. An obvious factor in this is the fact that requirements such as the circumcision of male converts and observance of the kosher laws is not required for Reform Jews. The Reform movement fully accepts gay and lesbian members, and some Reform clergy perform weddings or commitment ceremonies for Jewish gay and lesbian couples, as do some Conservative rabbis, but not the Orthodox. Reform Judaism celebrates an individual child's spiritual coming of age with becoming a Bar Mitzvah for boys or a Bat Mitzvah for girls at 13. 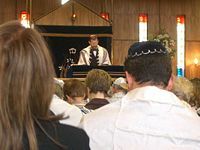 Many Reform congregations hold Confirmation ceremonies as a way of marking the festival of Shavuot and the decision of young adults to continue to embrace Jewish study in their lives and reaffirm their commitment to the covenant. Confirmation is typically held in the tenth grade after a year of study, but some synagogues will celebrate it in other years of high school. In the nineteenth century and the first half of the twentieth century, Reform Judaism rejected the idea that Jews should re-create a Jewish state in their ancestral homeland. They also rejected the idea that there would ever be a Jewish Messiah, that the Temple in Jerusalem would ever be rebuilt, or that one day ritual sacrifices would be re-established in a rebuilt Temple. Instead, the people of Israel were viewed as a Messianic people, appointed to be a "light to the nations" by spreading ethical monotheism over all the earth, and by being an example of moral rectitude to all others. Reform Jews ceased to declare the Jewish people to be "in exile," for the modern Jews in America or Europe had no cause to feel that the country in which they lived was a strange land. Many Reform Jews went so far as to reject prayers for the restoration of a Jewish homeland as incompatible with desiring to be a loyal citizen of one's nation. In the U.S., Reform intellectuals argued that their commitment to the principle of the separation of religion and state precluded them from supporting the Zionist movement. This attitude changed dramatically, however, with the rise of Hitler and the horror of the the Holocaust, after which many Reform Jews decided that the only guarantee for Jewish survival was the establishment of an independent state of Israel. Since the establishment of modern Israel in 1948, Reform Judaism has largely repudiated anti-Zionism, and the official platform of Reform Judaism today is Zionist. There are now many Reform Jews who have chosen to make aliyah (move to Israel), and there are several kibbutzim affiliated with the Israeli Reform movement. Israel itself does not officially recognize Reform rabbis, and the marriages that these rabbis perform are not valid in the State of Israel, due to the influence of the Orthodox parties in Israeli politics. The Reform movement nevertheless sends thousands of its youth and college-age students to Israel every year on summer and year-long programs. All rabbinical students at Hebrew Union College, the American Reform seminary, must spend a year in Israel absorbing the language and culture and becoming familiar with biblical geography. ↑ American Jewish History Society, The "Trefa Banquet" and the End of a Dream. Retrieved July 16, 2008. ↑ www.fewfaq.org, Movements of Judaism. Retrieved July 16, 2008. ↑ reform.org, Progressive Judaism in Israel. Retrieved July 16, 2008. Gotzmann, Andreas, and Christian Wiese. Modern Judaism and Historical Consciousness: Identities, Encounters, Perspectives. Leiden: Brill, 2007. ISBN 9789004152892. Levy, Richard N. A Vision of Holiness: The Future of Reform Judaism. New York: URJ Press, 2005. ISBN 9780807409411. Meyer, Michael A. Response to Modernity: A History of the Reform Movement in Judaism. New York: Oxford University Press, 1988. ISBN 9780195051674. This page was last modified on 7 July 2015, at 19:47.